The scrape of metal on ice changes as I move. there’s the soft shish of gliding on perfect smoothness, and the scrape sound when I slow or curve, shaving ice to slow down. There’s the vibration of milky ice that welled up then froze again, and the gritty sound of snow-crusted ice. This watery world is off limits to me most of the year. It’s too swampy for swimming, too shallow for boating, but now it’s mine for the gliding. I skate onto a space swept clear by wind, a curving plain with ice is so clear that the underwater world is revealed as if through a window. Only the cracks break the illusion: pale ribbons cross the ‘window,’ revealing foot-thick ice. It’s alluring. I speed up, soar across this glassy plain, and feel like I am flying over still water. A sudden move below, and I realize the fish are moving in the underneath. Curling to a halt, I kneel and bow to gaze between my mittened paws, peering into a world below the ice. A finny tail flicks out of sight. The sun glows, dully shining through a high thin sky, and I take to my blades again. My mirror is edged with tall marsh grasses, faded to gold against the grey. Beneath me, flashing white, dark deep and sky blues. My face is pinked with cold air and my heart happily pushes the air into my pumping limbs. >note: I searched but could not find the name of the painter of today’s image. If you recognize this painting or could shed any light on the artist, I’d appreciate it. 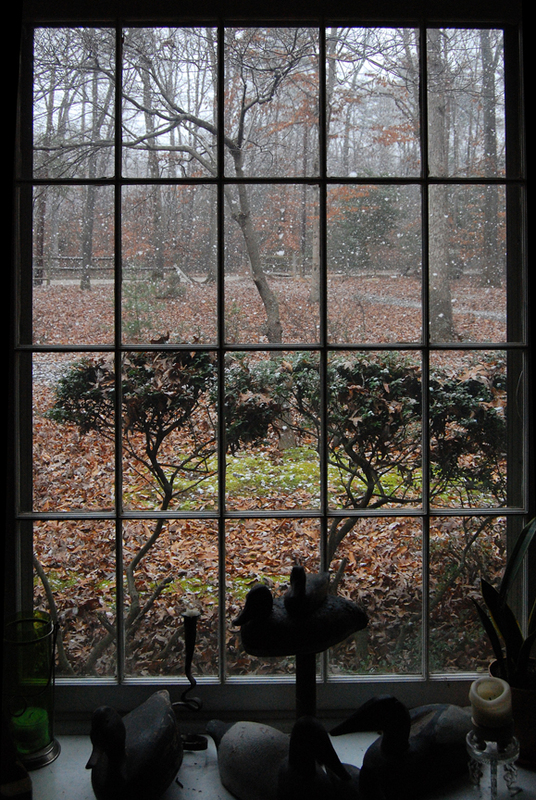 Blurred by ice-then-snow-now, grass and tree and house and bay are rendered in the softest greys. Meteoric, a crow as black as space lands on a tailwind. Then another; black feathers plump and shudder off the snow. They strut like they own the place. Which today, they do. Neighbors’ grand homestead, built out over decades of prosperity, has been surrendered to bankers, unmanageable. Dad became grandpa, then lost his memory one football story at a time. So now, a ghostly hulk, their happy place is falling to ruin. We had the world by the tail. We were invincible. We believed the tv gurus: you can have everything you want, if you focus clearly enough. They didn’t tell us how inevitable the wind worries away the rock, and how an arc must eventually return to earth. Let it snow, this cool balm, on the first days of spring. Breathe in the hush, let the softness dust your hair. It all happens right now. The house will disappear, and This will still be true. It’s just past Imbolc, candlemas, Groundhog Day. The time we witches dwell on the quiet of winter, halfway to spring equinox, when the fields lie quiet beneath the frozen ground. Most of my life, in New York and Michigan, winter arrived and laid down it’s coating of snow and ice, transforming the world. This year in southern Maryland, Winter and Spring are doing a see-saw dance, from frosty to balmy as the temperature swings from the teens to the 70s. My body can’t help but respond with joy to the warming temps. Physical happiness arises as I relax outside the bookstore, comfortable on a bench without my coat, absorbing the sunlight. The animals can’t either; I hear the hawks chittering their nesting talk to each other in a nearby tree. But my mind knows it’s not right. There should be a thick blanket of white insulating the ground. The fallow season may feel harsh, but it’s been the rhythm of life for millennia. That wintry state has its own pleasures, after you’ve hauled the wood and stoked the fire. So my unease isn’t just north or south, past or present, but Rural or Urban. The rhythm of ancient life is recorded deep within me. I feel out-of-sorts when I can’t heat my home with fire, nor draw my water from nearby. Without a garden, fruit trees and wildlife I feel incomplete. I’ve been grumpy about the unseasonably warm weather – over 70° leading up to Christmas just didn’t feel right. But heading into the end of the year, Voila! And it’s so crispy cold that the bay has frozen. There is a beauty to the frosted morning, a certain chilled pink and blue glaze over lawns and hills. White clouds lift from chimneys like weightless cotton candy. I don’t think of the water as noisy, but the hush when the bay freezes is palpable. I love winter. 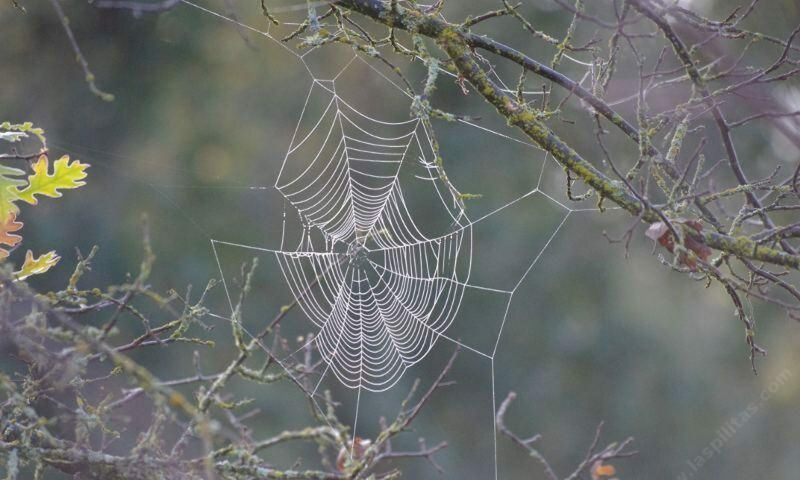 It has it’s place in the cycle of life, for hibernation, rest, reflection. It’s a time of meditation, reading and stirring a cauldron full of veggies to warm the belly. For a cat in the lap. For contemplation and planning, for reviewing and resolving to move ahead. Welcome, winter. Thanks to the Solstice we know your time is limited. I will enjoy you while you’re here. Have some images from my writing retreat at Ocean City Maryland, from Thanksgiving and the following weekend. There is nothing quite as beautiful as the edge of the world, all water and light. Fat flakes twirl in the unconstant wind, a cold breath that cannot make up it’s mind. Better this than a firm and determined wind today, for the mercury is falling, and any stiff breeze would surely find its way through my zipper. 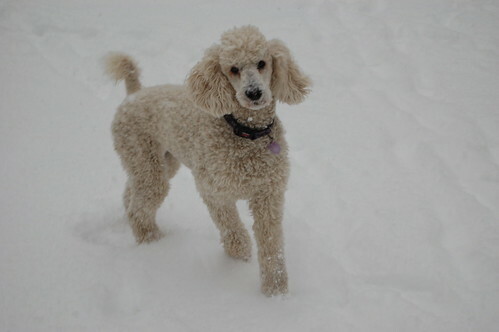 The dog, however, pays no mind to the chill, and leaps with joy, her normally white fur looking positively creamy gold against the snow. Her nose is powdered, her eyes are glinting, her tail is up. That is one happy beast. I’m trying to be half as chipper. I’m out her to please her, and rack up a few more steps on my pedometer, which has proven what I’ve long suspected: I am a sloth of epic proportions. Ten thousands steps a day? Lately getting over 3k is almost a miracle. Whatever; I have agreed to add at least 300 steps a day. So here we are, walking in a winter wonder land. The squirrels and deer know better, they are hunkered down somewhere. even the birds have gone to bed early. I’m fantasizing about a steaming bowl of porridge. But I am also feasting my eyes on a landscape transformed. This is the same place that hums with insects and frog music in the humid summertime, woven thickly with vines climbing high in the trees. Trees that now are charcoal grey drawings of themselves, waving like rushes in the wind. Which is picking up. I know I can enjoy it because my warm and cozy home is right there, no more than 300 steps from here. So I do enjoy it, the wind, wind that takes hundred year old and hundred foot tall hardwoods and makes them wave in unison, wind that sweeps over the frigid river encouraging it to ice, wind that would be deadly if I were out here 300 years ago in this flimsy coat. I’m an artist who lives for color, and today I’m thrilled by the grey of it all, quieting the hues down to barely readable: the green of holly leaves not really visible in their dark forms, a breath of gold where grasses still poke above the snow, and curled brown oak leaves that look like dried blood, the most brilliant thing around that isn’t white. Time for tea, and a book, curled up under the comforter. with a warm dog for extra heat. I give thanks for my indoor life. But I never forget what its really like. Out there. I always ask for snow for my birthday, but since it falls in November, I haven’t had my wish fullfilled in some years. Today, however, this quiet grey began to creep over the landscape as I was at the gym for morning workout. By lunchtime notable flakes were drifting down. 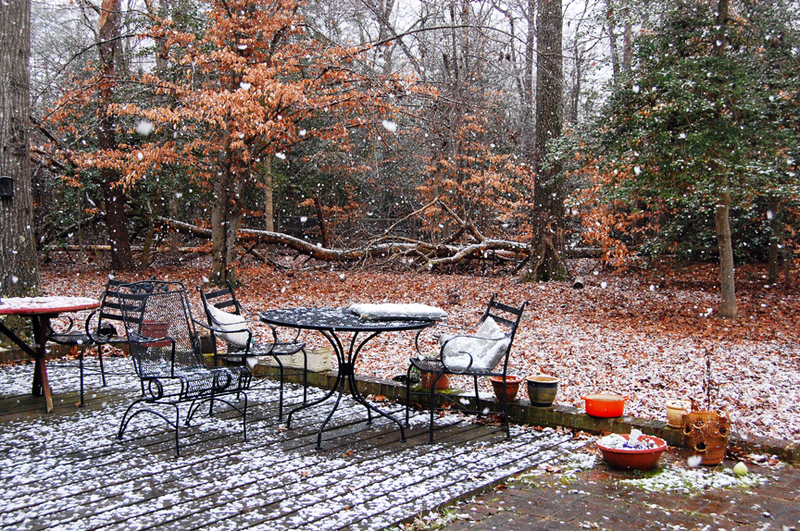 an hour later and they began to clump together: enormous flakes or tiny snowballs. Now they’re sticking around, beginning to coat a world in white. It will always feel like magic to me, this process. Tiny diamonds, one by one, join to transform the landscape, and they do it silently. The hush that snow brings feels like a holy breath, a significant blessing. I took the dogs to the river today, the sun was out! We’ve all been indoors too much, writing, painting, cooking. Today, walking was the first priority. The winter beech leaves can be quite a bright golden peach in the winter, contrasted with the drabness of dried leaves and bark. The green of moss and holly are most welcome. Add the blue sky and you have a beautiful winter palette. Of course the dogs were ecstatic. Oh, the joys of sniffing! Seneca forgets she’s a gimpy oldster at the park (this one) and romps like a puppy, a comical sight as she seems to gallop in slow motion. When we rounded the path to approach the boardwalk, a brisk wind was blowing off the river. This is often the case; inland even a few yards the climate can feel very different from what’s happening on the water. Today, this strong, steady breeze was whipping the shallows into tiny whitecaps, making a frothy sound. And the bare branches were making that distinctive wintery roar. My hair flew around and I felt the cold come through the buttons of my jacket. In the marsh a few groups of mallards were chattering nearby, then further back a flock of Canada geese rose up and make a V heading toward open water. But in the stiff breeze they seemed to hang motionless in the air. 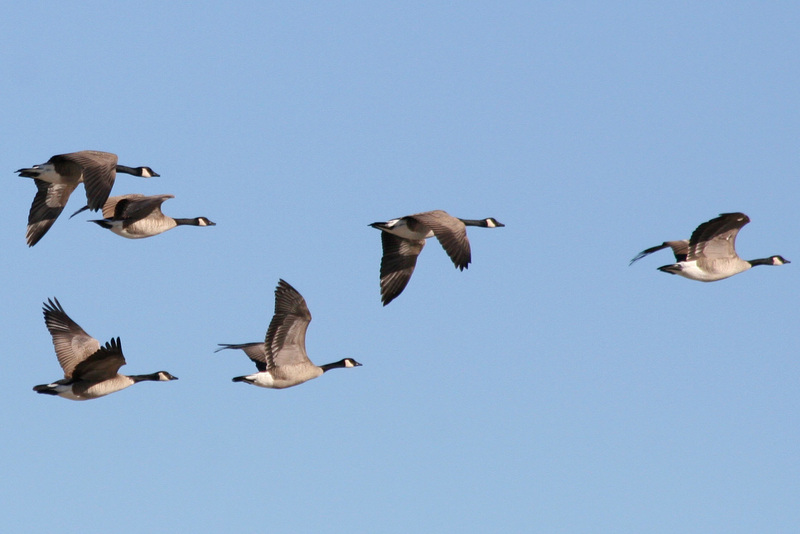 They were moving forward very slowly, and not really moving their wings. The wind alone was holding them aloft. It was eerie and beautiful, these big birds floating strongly, as if they reached the river on will alone. Sometimes where we are trying to go is harder to reach than we expect. But maybe there is an added lift, an unlikely gift, from the obstacle.